A while back, we posted about finding rare Panic boxes from our golden, miserable videogame era. These 1982 Atari boxes are great and all (they are! ), but many asked: what about the games? 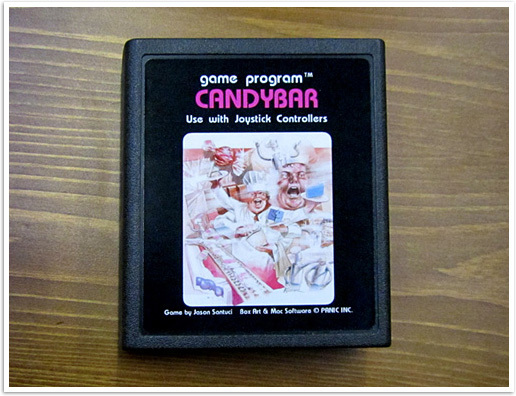 We took a short trip to our storage warehouse in Milpitas, CA and, after looking through more cardboard boxes than an IKEA BESTÅ, we found it: a single production cartridge of our lost CandyBar game for the Atari 2600. While it might not be an all-time classic, it’s definitely real — and a real trip to play again. Is the game hard? Well, about that… due to the dev crunch, we, uh, forgot to add lives. Or health. Or any way to die. That’s why marketing added the “for young children” callout on the box. We were all ashamed, but hey, we met our deadline and spent the afternoon in the hot tub. Is the game fun? Probably not. But it’s sure nice to see it again! And yes, like our boxes and posters, this game isn’t really from 1982. But this time, the real story is way better than the fiction. TIGsource, an incredible site for indie game developers (run by former Panic intern Derek Yu) had an inspired contest: A Game By Its Cover. The idea? Take a fictional, funny game box, and make an actual, genuine game for it. You can check out all the amazing entries here. Jason Santuci wanted to enter this contest. So he Goog’d around for ideas, and somehow came upon our fictional Atari 2600 boxes. Then he made an actual Atari 2600 game. Then he made a manual. Then he somehow made an actual Atari cartridge for us. To summarize: a real app became a fake retro artwork joke which became a real retro game based on the fake artwork for the real app. I love it. I also love that 2600-ized Finder icon. Better yet? If you’re handy with emulators, you can download and “play” CandyBar for yourself! Enjoy! It’s true: for the holiday season, we’ve dramatically slashed the prices on our retro posters and boxes! 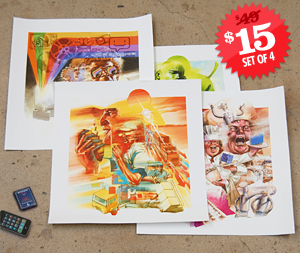 A set of four retro boxes is now $9, and a set of four retro posters is now only $15. I promise you: this is the coolest Panic collectible for you or your loved one. No internet can contain the quality, attention-to-detail, and awesomeness of these goods. We hope you like them! Buy Panic Retro Posters & Boxes Now! You guys. You guys are the best guys. Damn. That’s incredible. And the icing on cake is it being played on the world’s cutest TV. “…a real app became a fake retro artwork joke which became a real retro game based on the fake artwork for the real app.” My eyeballs just °360’d in their sockets. My daughters would go nuts for that TV! I just about did a back flip into the meat sauce. Retro shields down to 10%. That’s a lovely video for the game. What’s the song used? Awesome video. Cool TV. And, yes, I too would like to know the song used. What’s the model number of this LG TV set? I need to have it! Pacman: That’s a LG Serie 1 retro TV from… Korea! We imported it on eBay. And then had to buy a 500 watt step-up converter. A lot of work, but a truly cool CRT TV. Yeah, incredible. And you’ve found a great song for the video, the title? What “2600-ized” Finder icon? I want to see it but the download for the game didn’t have any special icons. I bought the prints just before Christmas on a whim, since I was already ordering some shirts from you guys. I thought they would be kind of dumb, but my God they look great. I expected to tack them onto my cube wall at work or something, but instead I went out immediately and got frames for them, hung them in a nice grid on my bedroom wall. I don’t know how you did it. These really do look sharp, amazingly they’re not as dumb as you’d think. Pictures just don’t do them justice. Glad I had the $15 to burn! I apreacipte you taking to time to contribute That’s very helpful.